Bright star cluster NGC 3532 contains stars of bluish color and also red giants glowing with an orange hue. Image released Nov. 26, 2014. A multicolored group of stars shine at the bottom of a cosmic wishing well in an amazing new image. The stars of the open cluster NGC 3532 glitter like the coins at the bottom of a fountain about 1,300 light-years from Earth. The European Southern Observatory's (ESO) La Silla Observatory in Chile captured the amazing blues, reds and oranges of the star cluster. You can also explore the ESO photo in a video of the star cluster released by the astronomy organization. 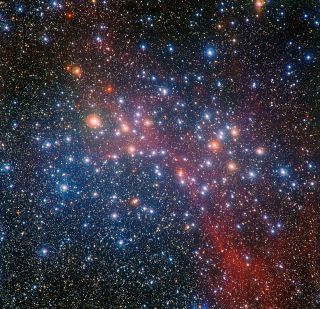 "This very bright star cluster is easily seen with the naked eye from the Southern Hemisphere," ESO representatives said in a statement. "It was discovered by French astronomer Nicolas Louis de Lacaille whilst observing from South Africa in 1752 and was catalogued three years later in 1755. It is one of the most spectacular open star clusters in the whole sky. NGC 3532 covers an area of the sky that is almost twice the size of the full moon." NGC 3532 (also called the Wishing Well Cluster) is about 300 million years old and contains about 400 stars. It is located in the constellation Carina. Famed astronomer John Herschel observed multiple binary stars within the cluster when he observed the open star cluster in the 1830s, according to ESO. Photographic material forming part of the Digitized Sky Survey 2 provides this wide-field view of the sky around the cluster NGC 3532. The bright blue stars visible in the new image were born with moderate masses, but the huge red giant stars have already gone through a large amount of fuel, ESO representatives said. The cluster shines with orange and blue stars because of those differences in mass. Large stars burn through fuel more quickly than moderately sized ones do. "Stars with masses many times greater than the sun have lives of just a few million years; the sun is expected to live for about 10 billion years, and low-mass stars have expected lives of hundreds of billions of years — much greater than the current age of the universe," ESO representatives added. The European Southern Observatory is acollaboration involving 15 different countries. ESO is responsible for three different astronomy sites in Chile at La Silla, Paranal and Chajnantor.